In mathematical terms, given a random variable X with distribution F, a random sample of length N is a set of N independent, identically distributed (iid) random variables with distribution F.
In our case, provided that with select our N samples randomly, each of these samples is itself a random variable normally distributed. This means that the sample mean is also itself a random variable. The sample mean is a random variable, and its outcome can be used as an estimator for the underlying actual mean. 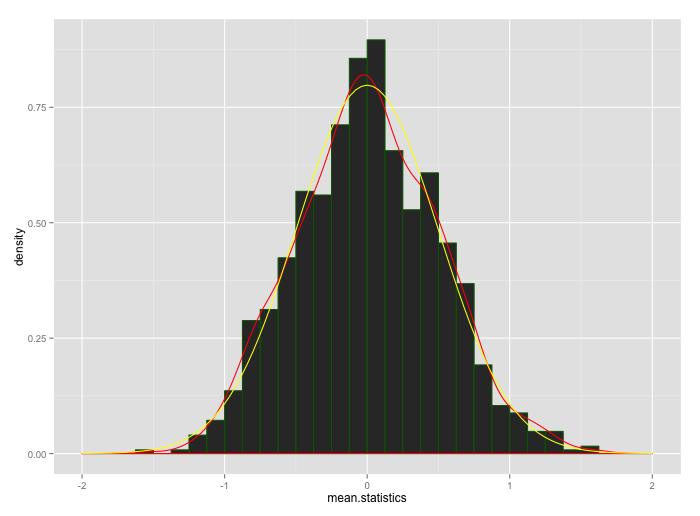 Why the sample mean distribution behaves as a normal distribution with standard deviation of 1/2? The bias defined as the expected error of the sample mean minus the true mean is zero. This formula was discovered by Bienaymé in 1853. It states that the variance decreases with the square root of the number of samples taken to build the estimator. Since in our case N=4, it means the the standard deviation of the mean is 1/sqrt(4), hence 0.5. If the mean is unknown, we can use the standard mean to estimate the mean. In this case we can depend on the statistics of the sample to assess the true mean. We have just seen the the sample mean is unbiased, but we have also seen that our mean estimation can have a certain error, (the standard error).